Solvents are used in nearly all industries, from cosmetics to semiconductors, and from biotechnology research to iron and steel production. 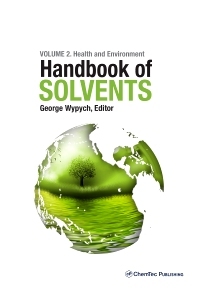 This book is a comprehensive and extensive textual analysis of the principles of solvent selection and use. It is a balanced presentation of solvent performance, processing characteristics, and environment and health issues. The book is intended to help formulators select ideal solvents, safety coordinators to protect workers, legislators and inspectors to define and implement technically correct public safeguards on solvent use, handling, and disposal. The volume begins with discussion of solvent use in over 30 industries, which are the main consumers of solvents. The analysis is conducted based on available data and contains information on the types (and frequently amounts) of solvents used and potential problems and solutions. This followed by discussion of residual solvents left in final products. The environmental impact of solvents, such as their fate and movement in water, soil and air, fate-based management of solvent containing wastes, and ecotoxicological effects are discussed. Practical guidance is also provided on immediate reaction to human solvent poisoning, persistence of symptoms of solvent exposure, and effects of solvents on various parts of the human body. These expert contributions should be frequently consulted by solvent users and agencies which are responsible for protection of people in industrial environments. Possibilities for solvent substitution are also discussed, with emphasis on supercritical solvents, ionic liquids, ionic melts, and agriculture-based products. Solvent recycling, removal from contaminated air, and degradation are covered. Discusses the latest advances and trends in solvent technolgy, including modern methods of cleaning contaminated soils, selection of gloves, suits and respirators. Readers who need to understand the health and environmental implications of a wide range of solvents. Engineers and Scientists in R&D, production chemists and engineers, environmental engineers, environmental professionals, civil engineers, university professors, students.